The 21st century has been hailed the nano-century, and major technological breakthroughs are expected from the control of the matter at the nanoscale. However, despite its promises, nanotechnology still seems to be stuck in the status of an emerging science, according to Assistant Professor Raphael Zingg of Waseda University and Dr. Marius Fischer of the Max Planck Institute for Innovation and Competition. With their work published in Nano Today on February 22, 2019, they shed light on the issue of technology transfer between universities and private entities that will develop commercial products. To study the issue, Prof. Zingg and Dr. Fischer examined aggregated data on nanotechnology patents by identifying all European patent applications relating to nanostructures from 1991-2016. Their findings showed that patents filed jointly by private and public organizations are on the rise, albeit on a small level. "While research institutions still develop the majority of their patents independently, our data fleshes out promising signs that private-public knowledge transfer is coming to fruition. Encouraging an environment where research institutions and private firms engage in collaboration is conducive to innovation in nanotechnology," writes Prof. Zingg. 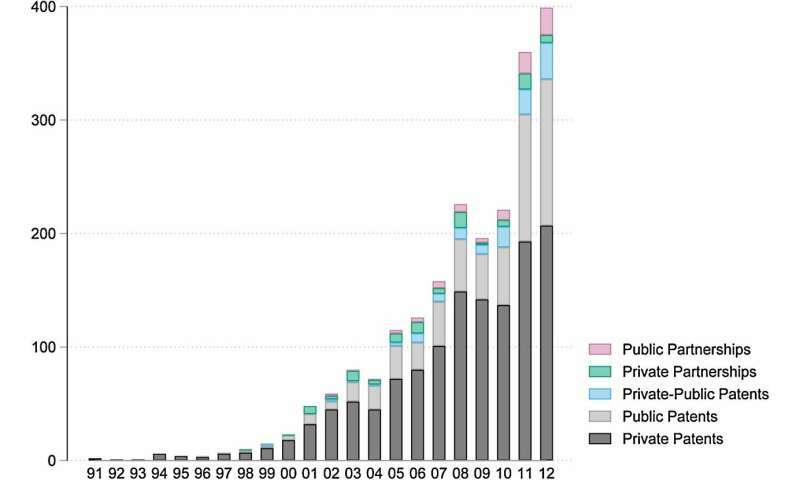 The two researchers found that though the number of nanotechnology patents filed jointly by private firms and research institutions may still be low in absolute terms, a sharp increase has occurred since the year 2000, and that in the most recent years, 8 percent of all patents have been filed jointly by private-public partners. 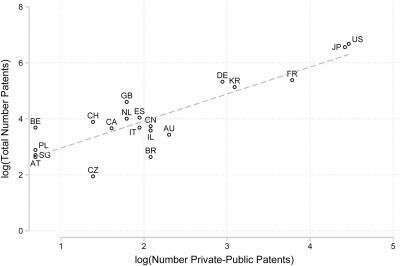 Additionally, they point out that private-public patent applications were filed with more patent offices than independently developed public ones, and Prof. Zingg suggests that such willingness to obtain a wider geographical protection and to invest in patenting strategies imply high internal valuation. They also find that in some countries such as the United States, France and Japan, where private-public patents are more frequent, the total number of nanotechnology patents tended to be higher. It seems that these countries have developed reliable frameworks and close institutional networks between entities active in nanotechnology. According to their data, Waseda University holds two nanotechnology patents granted in Europe. One of them, a patent on a hydrotalcite-like substance, has been the result of a partnership of the School of Science and Engineering with a private firm, JDC Corporation. The two partners have been engaging in research on wastewater treatment systems with nano layered double hydroxides. Said invention was patented in 2004 and filed in the main jurisdictions worldwide. "Collaborative trends in nanotechnology are reflected in the rise of private-public partnerships. The pooling of assets, know-how, and technologies provides innovators with better ways to address the challenges of innovation technology," Prof. Zingg says. "For countries entering the nano-space, we believe that the creation of industry clusters integrating academic entities has high potential."